I agree. It does seem counterintuitive. I get why they did it that way, to reduce the land needed, but from the perspective of a driver, it is a bit counterintuitive. I wander if sharing the center column like that saves money. It is a compact design land area wise. Yeah, TxDot has come along way in design and aesthetics. Those old designs don't save land. What they do save is the cost of building bridges or embankments to support those right turn ramps, since they're directly on the surface instead of the other style (e.g. US 75/PGBT) where the right turns are elevated. 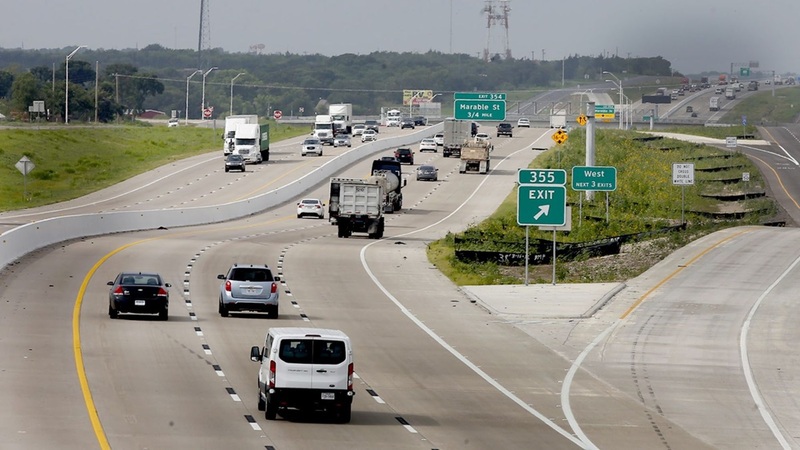 The biggest downside is that it makes it difficult/expensive to work that design into a 5-level interchange to allow continuous frontage roads for both freeways, although it can be done, like at the I-30/PGBT West interchange (ignore the N->E movement). I wish I-35 in Texas was like that when I drove it in 2008. What a slog of a drive that was. The I-10/I-15 interchange in Ontario, CA is a hybrid of that type and conventional: 2 directions with the left movement diverging prior to the right, and 2 conventional, with a split ramp system. As it was opened to traffic in 1979, most of the surrounding industrial area hadn't been built yet (I worked a couple of blocks away for several years, and the building I was in was built in '84). It seems that the EB I-10 to NB I-15 movement (essentially LA-Vegas) used the left-before-right approach to take the ostensibly largest volume of turning traffic off -- with the accompanying last-minute lane switches -- well prior to the rest of the interchange. The other L-before-R direction, SB 15 to EB 10, seemed to be done to save room for the then-proposed Ontario Mills mall, which abuts the NW corner of the interchange. The I-610 and I-10 interchange is in the Horizontal Scheme. 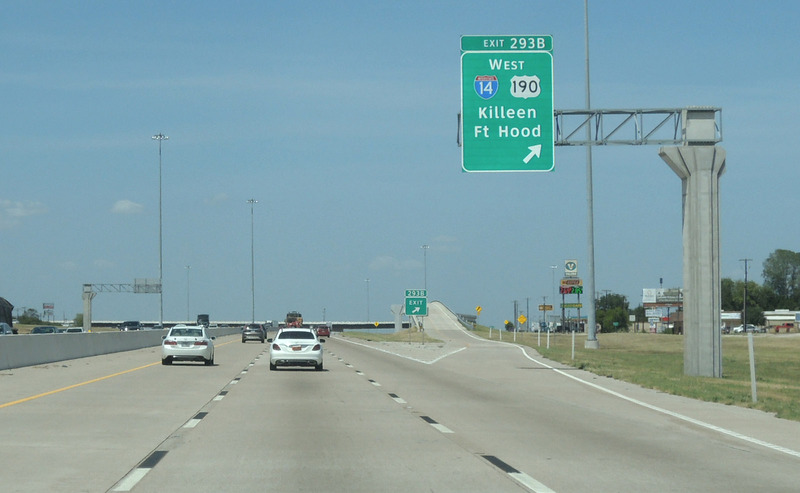 The Houston District uses Regional Urban Design Schemes depending on where the roadway is. Anything south of 290 and pretty much west of 288, and all interchanges regardless of location use the Horizontal Scheme to represent prairie. Any road north of 290 and north of I-10 the 610 West Loop to the Chambers Co. line uses the Vertical scheme to represent the Piney Woods, and anything south of I-10 from Chambers Co. to US59 and east of 59 and 288 is in the Wave Scheme to represent the coastal areas. The San Antonio District has similar themes using Mission and Hill Country themes, as does Austin. It's a nice touch on what would otherwise be drab looking infrastructure. I don't know if Dallas uses themes. It looks like each project there gets its own unique theme rather than a region based theme. 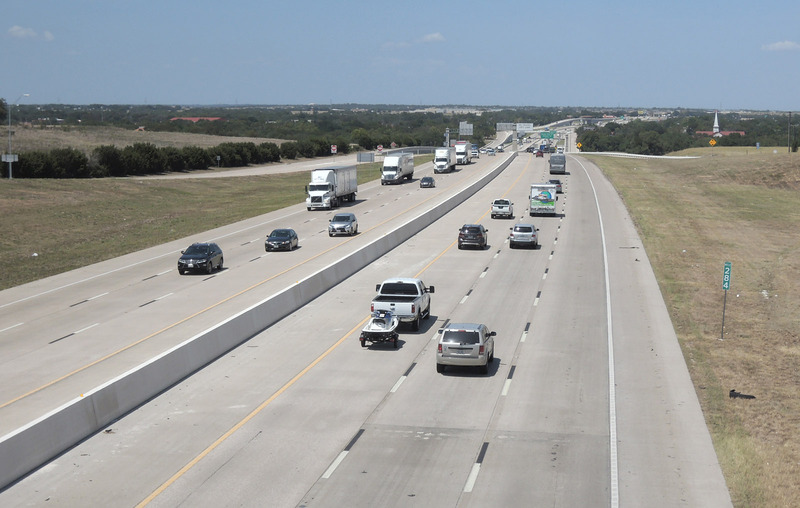 At Temple Texas, completion is set for 2019. 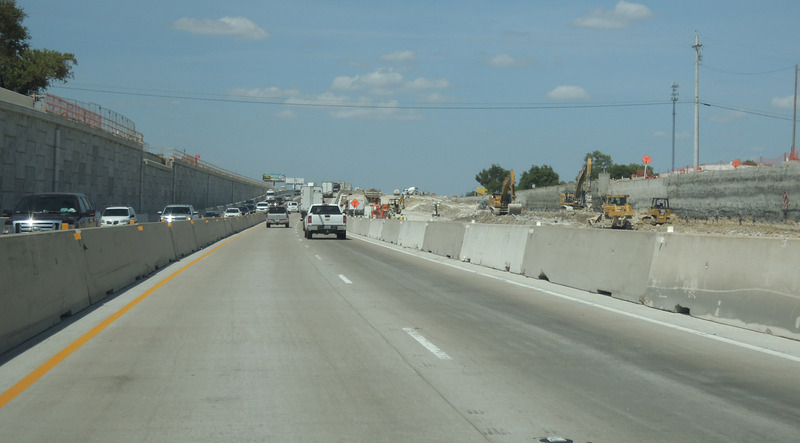 Drove on the new and moved access road in the pic this weekend, the trench for the southbound lanes are almost done. Southbound traffic is already using the new concrete till Adams/Central exit. I guess they will move the traffic over to the new access road bridge temporarily so they can deconstruct the present southbound lanes section of the bridge. The southbound I-35 lane has been moved off the bridge into the ditch. The idea was to squeeze a stack into as little real estate as possible to avoid (a) having to engage in any more eminent domain activity than absolutely necessary and (b) reduce property acquisition expenditure. Obviously, when these designs were modified in the ensuing years, such considerations had been relegated to a lesser priority. Part of the I35 viaduct is coming down. 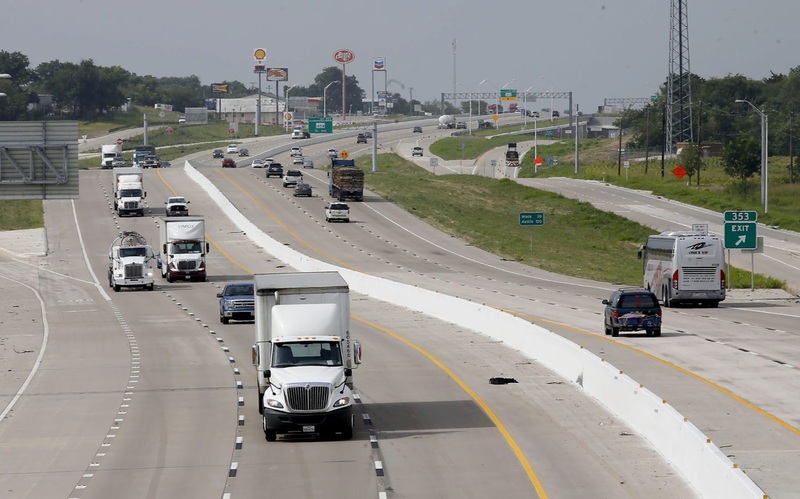 Went through Temple on I-35 and the progress they have made is impressive. The long bridge.............errrr.........."Aqueduct" is now torn down and both north and southbound lanes are in the trench. I imagine this will significantly speed up the rebuidling process through Temple since now the construction crews and concentrate on completing the northbound side. I believe construction through Temple was suppose to be completed this summer or fall. And one more thing, those who are familiar with the old 35 through Troy. What I used to call the " the bat tunnel", a relic from the 1960s engineering and always flooded when it rainED is gone. Both lanes have moved to the new southbound bridge. That bridge is incredibly strong. Like the I-35 long bridge in Temple that per the engineer words," did not want to come down, it was built to last". This bridge in Troy has been hit sooooo many times, its amazing its in as good shape as it was. They is some thing to that saying, "they do not build them like they use too." Cool to see it coming along. 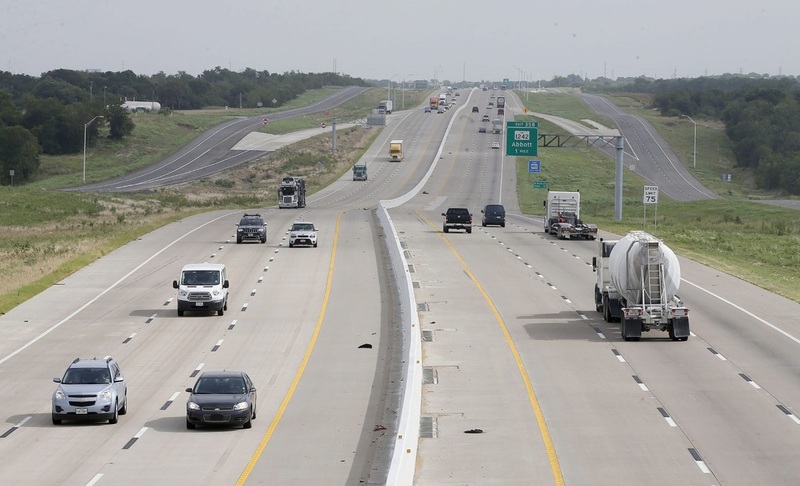 I gave up on I-35 through Texas back in 2014, so I haven't seen any of the construction firsthand since then. Every time I would drive through Temple, I would think to myself, How the heck are they going to make this work? And I thought the same thing about Troy. Yesterday I drove from Salado (South of Temple) to Waco. 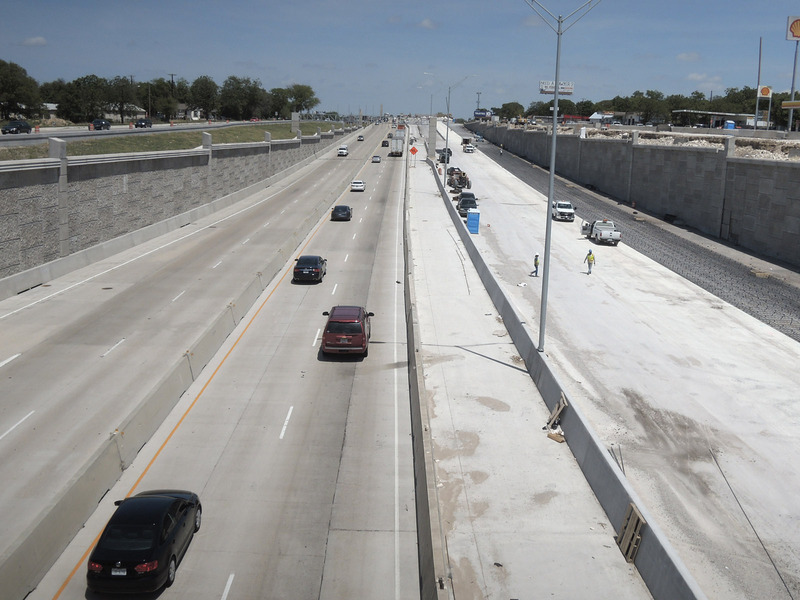 All work is complete south of Loop 363 in Temple. In Temple, work is substantially complete and looks like it should be done within 6 months. North of Temple to Bruceville-Eddy, work is nearly complete, with only final work like the median barrier and restriping to be done. However, there is still major work to be done at Bruceville-Eddy, probably 6-months of work. North of Bruceville-Eddy to Waco, it is complete. Completed sections have a nice roomy feel. But the $304 million expansion in Waco is slated to begin in 2019. Between Temple and Bruceville-Eddy, much of it is done but not yet striped for 3 lanes. This shows a typical configuration with wide separation between the main lanes and frontage roads, which are continuous. This is at Bruceville-Eddy, the spot which will probably take the longest to finish, maybe 6 months.